“Eremitical life is, as the title indicates, a silent preaching and a minor church reflecting the entire Church. Despite its long story, this life has not been seriously studied for many centuries; thus, this book, based on a dissertation done at the University of Münster in Germany, aims at locating this life within the Catholic Church. The author, a Carmelite sister, is the Director of the Edith Stein Archive at the Carmel in Cologne and teaches spirituality at the Institute for Deacons’ Formation of the Archdiocese of Cologne. The author states at the outset that hermits are a rare form of consecrated life, yet have an important function as a silent preaching that points to the “ultimate goal of human life, an unceasing living in the presence of God.” This religious vocation is now too little known, disappeared in Europe in the 18th century, and was not even mentioned in the Code of Canon Law of 1917. 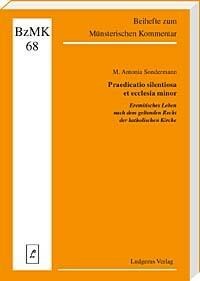 Sondermann provides a canonical and a theological reflection about the eremitical life, which has seen a revival, small though it is, in Europe in the second half of the 20th century. The book is divided into four parts: Part I presents a short history of canonical laws dealing with hermits in the Eastern and more specifically in the Latin Church from antiquity to the 18th century; Part II gives a brief description of eremitical life in the Uniate Eastern Churches and the Code of Canons of the Eastern Churches; Part III discusses the codification of this life in the 1983 Code of Canon Law; and Part IV describes current eremitical life in Germany based on a survey and further inquiries the author conducted. Although Sondermann’s historical description of eremital life and the early attempts of codification is brief, the variety of life forms is quickly evident and, with it, the difficulty of providing a canonical framework. Part III, the longest part, first focuses on the complicated genesis of canon 603, the only canon in the 1983 code mentioning hermits. While this canon sees hermits as part of consecrated life in general, they are not part of religious or secular institutes. The canon designates the diocesan bishop as competent authority for hermits and for all the Christian faithful, clerics and lay, who feel called to this life. Exceptions are eremitical orders such as the Camaldolese and the Carthusians, and some orders that make allowance for hermits in their proper law. In discussing the theological/spiritual meaning of eremitical life as described in canon 603 §1, the author shows a deep understanding of this vocation and its silent significance for the Church and the Christian faithful. This part may be especially helpful for anyone wanting to know more about an eremitical vocation. With regard to canon 603 §2 she discusses the responsibilities of the diocesan bishop as the superior of hermits not connected to a religious institute, the criteria for evaluating such a vocation, formation, departure, the public profession of the evangelical counsels and the proper law guiding a hermit’s life. This part is important for hermits and their diocesan bishop. Part IV about current eremitical life in Germany shows the renewed interest in this vocation, the variety of chosen life forms as well as the difficulties in realizing such a life in the 21st century. You are currently browsing the Citydesert blog archives for March, 2016.